An occasion to Cherish for the rest of your life..
For entertainment at weddings and receptions, a professional DJ is a very important accent. A part of creating the proper ambiance for your wedding reception, the DJ gets people dancing as well as participating in the celebration. The right choice of music from the DJ will enable you to sit back, relax and know all your guests are having a wonderful time. There's enough to worry about on your wedding day, let Arkansas DJ Service make that day a little easier and more memorable. With Arkansas DJ Service you can be assured that a professional wedding Disc Jockey is respectfully handling your guests. Our DJs not only energize your guests with a notable selection of music, but also add additional ambiance with lighting and special effects. We will act as the Emcee, announcing the entrance of the Bride & Groom and wedding party, cake cutting, bouquet/garter toss as well as coordinating with your other services (photographer, videographer, etc.) throughout the ceremony and reception. When it's time for speeches and toasts we will provide your speakers with a wired or wireless microphone. Watch This Video It is Great! 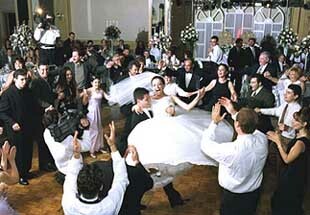 Arkansas DJ Service offers wedding planning for Arkansas brides. We have some great online tools to plan your very special day. Our DJ service is commented to make your wedding day a complete success and we can help make it a wonderful time by offering our online tools to plan your event. These special tools work great even if you already have an event planner or wedding coordinator. Once you create you event using our online tools. It is then emailed right to our DJ or DJs and they have your complete itinerary and will coordinate your special event. In fact, these online tools work great with your wedding coordinator and they really enjoy them as well.